Like no other artists (not including composers, obviously), Gustav Klimt and his intellectual offspring Egon Schiele and Oskar Kokoschka are linked with the modern age in Vienna - and shamelessly exploited by the tourism industry of the country. These three artists are always seen as a unit, and whilst I can see a direct link between Gustav Klimt and Egon Schiele, and even between Klimt and Kokoschka, I really don′t see why this "unit" excludes the work of many other Austrian expressionists. As for Schiele, I think his work stands out from all of Vienna′s art world of the modern age, whereas I wouldn′t think that of both Klimt and Kokoschka. Anyway, the "trio" as a unit has proved to sell exceptionally well. Since this website deals with travel-related topics and many people come to Vienna to see work by these three artists, I think it is justified if I follow the common line of though and against my personal views write a short biographical sketch of Klimt, Schiele, Kokoschka in one article. Note that there are more elaborate articles available on Wikipedia and many other sources; if you want to see some of their works in Vienna, I recommend the Belvedere Palace and Austrian National Gallery and the Leopold Museum in the MuseumsQuartier. Gustav Klimt was borin on the 14th of July in 1862 and was the second of seven children. He spend a rather unspectacular childhood in Vienna and together with his brother Ernst, enrolled at the "Kunstgewerbeschule", an art and design college. There they met Franz Matsch, whith whom they joint their creative forces to share a combined workshop, called "Künstlercompagnie". It was a good time for artists who were skillful and willing to pimp out their talent to the historicist upper-class that ruled Vienna in the second half of the 19th century: The Ringstraße was in development and all the historicist palaces needed decorations and ornaments. The Klimt brothers soon secured some important orders, the most significant were paintings of the interiors of the newly built Burgtheater and the Kunsthistorisches Museum in 1883. In 1897, Gustav Klimt became a founding member of the Wiener Secession - as an already established and quite wealthy artist, he could afford to support young revolutionaries such as Schiele and Kokoschka. In 1905, Klimt had made symbolist paintings for the interiors of Vienna University. 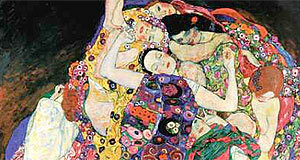 These caused a scandal and were dismantled, Klimt was upset and bought them back. He was so mad at the Viennese society that he withdrew from public life and lived of concessions that he got through his excellent contact to Vienna′s liberal aristocracy. In this period, he made many of his most famous portraits. Klimt′s girlfriend Emilie Flöge owned a house in Unterach by Lake Attersee in the Salzkammergut. Klimt and Flöge spent many summers there. Apart from concession work and portraits, Klimt was active in the Secession and created "private" artwork that became increasingly abstract. These later works in combination with the often very abstract landscape paintings from the Attersee were very contraversely discussed by art critiques in Vienna - however, they did not harm Klimt′s reputation as an artist anymore. He was nationally and internationally highly regarded. In 1918, Klimt died as a result of a stroke. His last workshop had been in the Viennese suburb of Hietzing, where he is buried. Continue with "Egon Schiele & Oskar Kokoschka"